36mm 18K pink gold and steel case, 9.46mm thick, 18K pink gold crown set with a synthetic cabochon-shaped spinal, sapphire crystal, silvered opaline dial with blued-steel sword-shaped hands, self-winding movement, brown alligator skin strap, 18K pink gold ardillon buckle. Water resistant to 30 meters. Large size, stainless steel case, silver dial, quartz movement, alligator strap with stainless steel deployant buckle. Water resistant to 30 meters (100 feet). 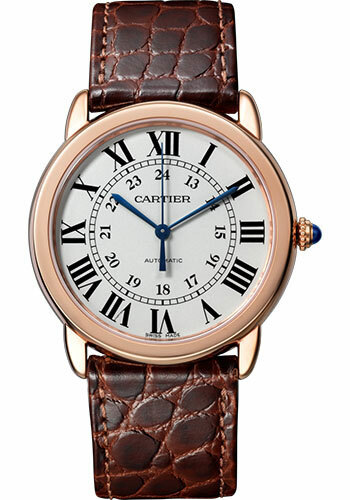 Large size (36mm) 18K yellow gold case, stainless steel back, silvered opaline dial with Roman and Arabic numerals, quartz Cartier calibre 115A movement, alligator strap with 18K gold ardillon buckle. Water resistant to 30 meters. 36mm 18K pink gold case, 6.51mm thick, sapphire back, beaded crown set with a synthetic cabochon-shaped spinel, 18K pink gold bezel, sapphire crystal, silver dial with roman and arabic numerals, quartz movement with sword-shaped hands in blued steel, brown alligator skin strap with round-scale, ardillon buckle. Water resistant to 3 bar. 36mm stainless steel case, 9.46mm thick, beaded crown set with a synthetic cabochon-shaped spinal, sapphire crystal, silvered opaline dial with blued-steel sword-shaped hands, automatic movement, stainless steel bracelet. Water resistant to 30 meters. 36mm stainless steel case, 9.46mm thick, beaded crown set with a synthetic spinel, sapphire crystal, silvered opaline dial with blued-steel sword-shaped hands, self-winding movement, black round-scale alligator-skin strap, steel double adjustable folding buckle. Water resistant to 30 meters. 36mm steel case, 9.46mm thick, beaded crown with a synthetic cabochon-shaped spinel, sapphire crystal, silvered dial with Roman numerals and blued-steel sword-shaped hands, automatic movement, black calfskin strap with interchangeable strap, double adjustable steel folding buckle. Water resistant to 100 meters.